Squeezed in an all-day Match Racing clinic out at Oak Cliff Sailing Center on Saturday (in a driving rain storm). Great info. 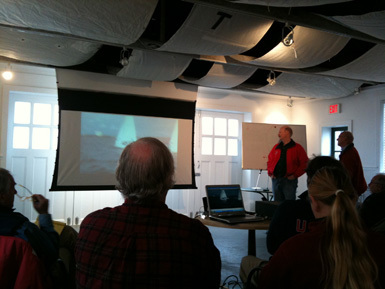 The clinic was led by legendary sailor Dave Perry (Dave is actually seated in front of the computer in this picture and in videos below, NOT standing with red jacket). There are so many references to him and his accomplishments on the Web, I didn’t know where to link to. It’s humbling to sit in the audience, and later this year looking forward to getting some of his insight when we’re out on the water. Oak Cliff’s Exec Director, the super accomplished Dawn Riley , took over after to talk about the upcoming season and sounds pretty exciting. Dawn Riley on Twitter here. Oak Cliff – One from John Pasmore on Vimeo. Oak Cliff – Two from John Pasmore on Vimeo. The clips just give a sense of the day and apologize for their lack of substance, but you know, you gotta sign-up for the clinic! Takeaways were read the rules and know the rules because your tactics are dictated by the rules as much as the wind. This entry was posted by John Pasmore on Sunday, March 14th, 2010 at 7:56 pm	and is filed under New York, Outdoor and tagged with Dave Perry, Match Racing, Oak Cliff Sailing. You can follow any responses to this entry through the RSS 2.0 feed.